Who doesn’t love fire? I’m pretty sure I was born a pyro, and thus I couldn’t resist using fire in my photography at some point. 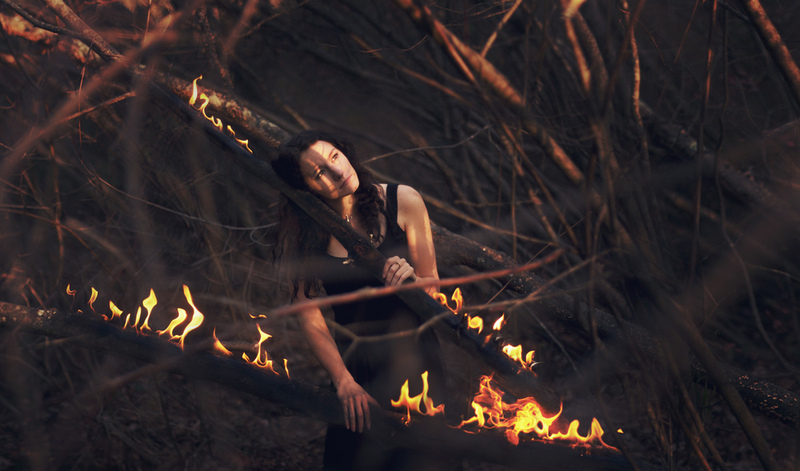 All the fire I use in my photos is real, and I’m going to share a few tips on how to use fire safely while still getting the most realistic results. This is pretty simple, but old warehouses and wide open studios are both good places to use fire if the right precautions are taken; of course be sure that your actions are legal, and prep the space for total safety. In a concrete space, you really don’t have to worry about the fire itself, just make sure the fire doesn’t get too large and produce excess smoke. In a studio space, just make sure you have the ground and surroundings protected. If you just need a small flame and want to shoot outdoors, just be wise in choosing an area with dirt on the ground as opposed to tons of dry leaves or grass. Don’t forget the H2O and assistants. I never use fire without an assistant; while you’re busy trying to capture the perfect image, you HAVE to ensure that your fire doesn’t get out of control or harm a subject. During my indoor and outdoor shoots, I always keep a bucket of water near the shoot and backup water bottles and damp towels to pat out the flames. I usually let a flame burn for no more than 10 seconds while I get various shots; if you let the flames burn longer on whatever surface you’re working with they become harder to put out. I also suggest having some sort of fireproof glove or mit for whoever is directly handling the flames. If the fire is going to be any larger than a single small flame, a fire extinguisher would be a good idea! Something I discovered when burning cardboard cutouts is that when you pour lighter fluid over the surface of something, flames tend to burn the fumes and go out on their own before they actually burn through the surface of any given material (save paper perhaps). When I photographed the below image of the burning city, I had an assistant lighting each building, we let it burn for about 4-6 seconds while I got shots, and then they were able to just blow the flame out. This method can be used for all sorts of surfaces if you simply need a flame and not a burnt surface. Using gas can work for larger flames in a safe space, however it is much more likely to burn through the surface of a substance quicker than lighter fluid would. Although I try to get as much as possible in camera, sometimes compositing extra pieces of flame is safer than trying to get all the flames you want in one shot. An especially great example is the burning city image above; lighting all those cardboard pieces at once would have certainly caused an unmanageable fire. However, with my camera on a tripod, I was able to seamlessly capture various shots of flames separately and work them together in the final image. The only thing I had to keep in mind was that I’d have to edit in red glow of the flames as well. As long as you’re smart and think through the problem solving of any given shoot, you should be able to work with fire safely. If you think a precaution is needed, don’t hesitate, just take it to be safe! Most of all, enjoy the process- working with fire is fun and can be so rewarding in the final product!